Product prices and availability are accurate as of 2019-04-22 06:28:44 UTC and are subject to change. Any price and availability information displayed on http://www.amazon.com/ at the time of purchase will apply to the purchase of this product. Perfectly chilled and ready to serve wine is what you get with the Sunpentown WC-1272H 12-Bottle Thermo-Electric Wine Cooler with Heating. Utilizing thermoelectric heating technology, this savvy cooler will heat or cool itself once the ambient temperature rises or falls below its set temperature. Thermoelectric technology is environmentally friendly and requires no refrigerant. 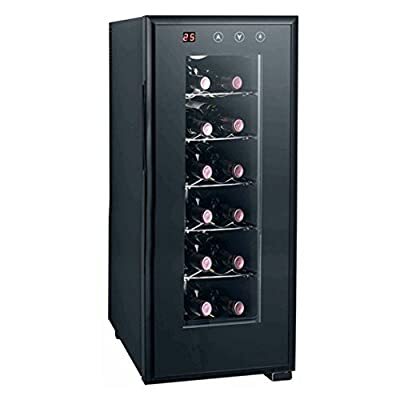 Additionally, because no compressor is used, the unit operates quietly and does not vibrate, preserving your wine's integrity by not disturbing bottle sediment. Its streamlined and sleek exterior is ideal for discreet storage in your dining room or in smaller kitchens that lack extra counter space. The digital controls allow for precise temperature settings and are adjustable between 51 to 64 degrees Fahrenheit. The large LED temperature display is bright and easily visible, even during late-night dinner parties. Double-paned, insulated glass preserves the interior temperature while allowing you to quickly scan its contents. The interior light and sliding shelves help you identify the bottle you need, allowing the party to go on seamlessly. For more cooling technology information, please see our wine storage tips. Sunpentown International designs and manufactures small home appliances for convenient kitchen use. Sunpentown is the largest single producer of induction cooktops in the world, controlling over 70% of the domestic market. Aiming to stay at the forefront of induction technology, Sunpentown is proud to introduce a new line of uniquely competitive built-in and Wok induction cooktops to appeal to the increasingly global market of the 21st century. Dimensions: 10W x 22D x 26.5H inches. Slim profile touts 12-bottle capacity. Discreet black exterior. Single-zone temperature control. Thermoelectric cooling and heating is vibration-free. Includes 5 slide-out shelves.